Biological growths in drip lines and emitters can be a serious problem when the irrigation water contains organic sediments, iron, or hydrogen sulfide. The primary contributors to biological growths are algae and bacteria. 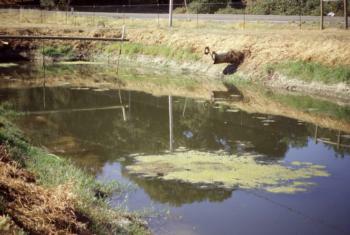 Algae occur in surface waters used for irrigation; their food sources include carbon dioxide, nitrogen, and phosphorus. While the filtration of microirrigation systems removes some of the algae, small particles of algae can pass through the filter and into the drip system. Algae also provide an organic food for slime organisms. Bacteria discolor the water and form precipitates and slimes that stick to the walls of the emitter flow passages. Although algae and bacteria may be small enough to pass through the filtration system, bacterial clogging may occur when mineral food sources are available in the water along with suspended particles to which the bacteria can attach and form larger masses that may clog the emitters. Food sources include organic carbon (dead algae), carbonates and bicarbonates, iron, and hydrogen sulfide. Iron-rich water leads to the formation of iron bacteria, which convert soluble iron to insoluble iron precipitates. The result is a red, yellow, or tan slime in the drip lines and emitters. The source of the iron bacteria is not always clear, but it may be the result of contamination during well construction. Iron concentrations of 0.2 ppm are sufficient to support bacterial growth. Hydrogen sulfide in the irrigation water results in sulfur bacteria, a whitish slime with a rotten-egg odor. Click here for information on predicting the biological clogging hazard. Click here for information on solutions to biological clogging problems.